Irrigation | Obermeyer Hydro, Inc. The precise level and flow control provided by the Obermeyer Gate System facilitates controlled water diversion at rivers without fluctuations in diverted flow caused by river flow changes. Automatic water level control at canal drop structures provides uniform discharges at canal outlets under varying flow rates. Obermeyer Gate Systems can also seal against an overhead bulkhead in order to block flood flows from a canal intake, for example. Automatic level control may be used to operate a canal at maximum capacity and maintain constant discharge at laterals or siphons without the danger of overtopping due to upstream level changes. Automatic controlled lowering of Obermeyer Spillway Gates during flood events prevents upstream flooding and allows the impoundment to be periodically cleared of sediment. The bottom hinged design is ideally suited to passing debris without becoming blocked or jammed. 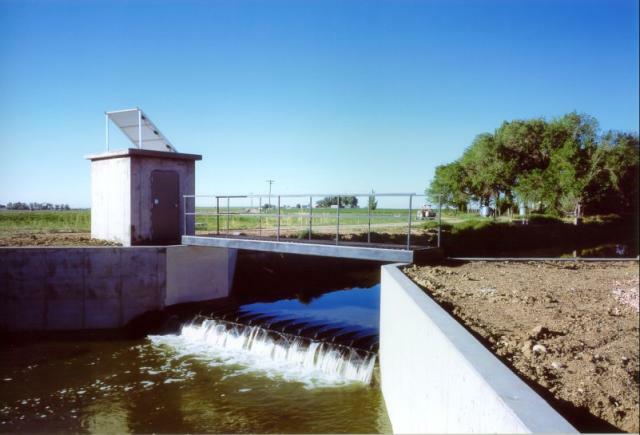 In cases where sediment intake into irrigation canals should be limited, Obermeyer gates controlling a canal intake may be operated in a partially raised position in order to "decant" lower sediment water from the surface. Such an arrangement is also highly desirable at pumping station intakes in order to maximize pump life. This arrangement is also used to keep sediment out of off-stream storage reservoirs in order to greatly extend the useful life of storage reservoirs, which would otherwise eventually loose their water storage capacity to sedimentation.